We have a lot to offer at The King’s Academy, and we hope you will take advantage of these opportunities. Most of our extracurricular club activities occur twice monthly on Thursdays, but some accredited classes meet weekly. Please contact the sponsors listed for additional information. Science Labs are a mandatory requirement for high school science courses. These classes are held every other Thursday at the high school building. Math Labs are not mandatory but highly encouraged, especially for high school math classes and for students who may not be mathematically inclined. No new material is taught at Math labs; these instruction periods are used as reinforcement for the week’s lesson or to help students who may be struggling with a particular concept. Math labs are held every Thursday. 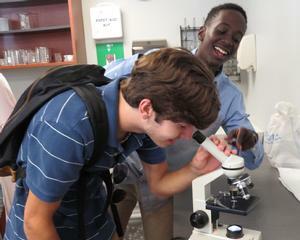 Our Spanish faculty also offers lab sessions on Thursdays.